The A259 between Rye and Brookland is ‘fully reopen’ after this morning’s collision, according to traffic reports. Traffic reports said a van collided with a telegraph pole at 4.24am between the junctions of Camber Road and Hook Lane, near Brookland, resulting in a set of power cables coming down. 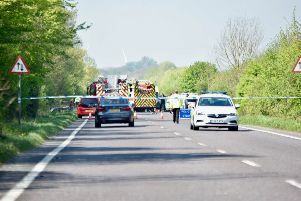 The collision led to the road being closed between the A268 and the A2070 in both directions so the telegraph pole could be made safe, Highways England said. The road was reopened at 11.27am. Traffic reports said traffic between Hastings and Folkestone was affected. Traffic was diverted away from the scene throughout the morning, according to Highways England. Highways England confirmed there was just one vehicle involved and police were called to the scene. A police spokesman said nobody suffered injuries and the incident was handed over to Highways England at approximately 7am.